↑ 1,0 1,1 Strom M. Marvel's Doctor Strange Conjures Up a November 2016 Release Date: The Master of the Mystic Arts set to make his big screen debut in just 2 years! // marvel.com — 2014. ↑ 2,00 2,01 2,02 2,03 2,04 2,05 2,06 2,07 2,08 2,09 2,10 2,11 2,12 2,13 2,14 2,15 MARVEL'S 'DOCTOR STRANGE' BEGINS PRODUCTION: Learn the full cast of the film, in theaters November 4, 2016! // marvel.com — Marvel Entertainment, 2015. ↑ 3,0 3,1 Strom M. BENEDICT CUMBERBATCH TO PLAY DOCTOR STRANGE: The celebrated actor to become the Sorcerer Supreme! // marvel.com — 2014. 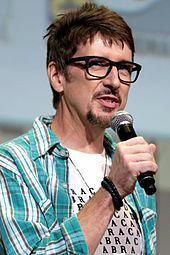 ↑ Romano N. ‘Doctor Strange’ Re-Teams Director Scott Derrickson With ‘Sinister’ Writer C. Robert Cargill // Collider — 2015. ↑ 5,00 5,01 5,02 5,03 5,04 5,05 5,06 5,07 5,08 5,09 5,10 5,11 5,12 5,13 5,14 5,15 5,16 5,17 5,18 5,19 5,20 5,21 5,22 5,23 5,24 5,25 5,26 Doctor Strange Press Kit — The Walt Disney Company. ↑ 6,0 6,1 Strom M. D23 Expo 2015: Marvel's 'Doctor Strange' Updates & More: Kevin Feige took to the stage to show fans new footage, give casting updates & more! // marvel.com — 2015. ↑ Geier T. ‘Transparent’s’ Amy Landecker Joins Benedict Cumberbatch in Marvel’s ‘Doctor Strange’ (Exclusive) // TheWrap — 2015. ↑ Geier T. Martial Artist Scott Adkins Joins Benedict Cumberbatch in Marvel’s ‘Doctor Strange’ (Exclusive) // TheWrap — 2015. ↑ Hunt J. Doctor Strange: post-credits scenes explained // Den of Geek — 2016. ↑ Doctor Strange Press Kit — The Walt Disney Company. — P. I. ↑ Chitwood A. ‘Doctor Strange’ Sets Michael Giacchino to Compose the Score // Collider — 2016. ↑ Sacks E. Benedict Cumberbatch, Chiwetel Ejiofor spotted shooting scenes for Marvel’s ‘Doctor Strange’ in New York // New York Daily News — New York City: 2016. ↑ Meier B. Benedict Cumberbatch is filming at Exeter College tomorrow // The Tab — 2016. ↑ Beyers T. Instant Analysis: For Disney Investors, "Doctor Strange" Is Tracking Disappointment // The Motley Fool — 2016. ↑ 32,0 32,1 Damore, Megan (December 28, 2015). «LOOK: Benedict Cumberbatch Makes Magical First Appearance as 'Doctor Strange'». Comic Book Resources.